Difference between revisions of "Tsokye Tuktik"
'''Tsokye Tuktik''' ([[Wyl.]] ''zab lam mtsho skyes thugs thig las: ma ha gu ru phyi ltar o rgyan sman gyi bla mar sgrub pa'') 'Heart Essence of the Lake-Born Vajra, the Secret Accomplishment of the Great Guru' is a [[mind terma]] of [[Dudjom Rinpoche]] focused on [[Guru Rinpoche]] in the form of [[Guru Tsokyé Dorje]], which was revealed in 1929. It is the main [[lama]] practice in the [[Dudjom Tersar]] lineage, and one of the four main [[terma]] cycles of Dudjom Rinpoche<Ref>The three other cycles are the [[Pudri Rekpung]] cycle, the [[Khandro Tuktik]] cycle and the [[Dorje Drolö]] cycle.</Ref>. '''Tsokye Tuktik''' (Tib. ཟབ་ལམ་མཚོ་སྐྱེས་ཐུགས་ཐིག་ལས༔་མ་ཧ་གུ་རུ་ཕྱི་ལྟར་ཨོ་རྒྱན་སྨན་གྱི་བླ་མར་སྒྲུབ་པ་, [[Wyl.]] ''zab lam mtsho skyes thugs thig las: ma ha gu ru phyi ltar o rgyan sman gyi bla mar sgrub pa'') 'Heart Essence of the Lake-Born Vajra, the Secret Accomplishment of the Great Guru' is a [[mind terma]] of [[Dudjom Rinpoche]] focused on [[Guru Rinpoche]] in the form of [[Guru Tsokyé Dorje]], which was revealed in 1929. It is the main [[lama]] practice in the [[Dudjom Tersar]] lineage, and one of the four main [[terma]] cycles of Dudjom Rinpoche<Ref>The three other cycles are the [[Pudri Rekpung]] cycle, the [[Khandro Tuktik]] cycle and the [[Dorje Drolö]] cycle.</Ref>. The Tsokye Tuktik is a lama practice focused on Guru Rinpoche. The outer form of the lama is [[Orgyen Menla Dütsi Bum Zang]], the inner form is [[Lama Orgyen Khandro Norlha]], the secret form is '''Tsokye Tuktik''' (Lake-Born Vajra, [[Guru Tsokyé Dorje]]) and the innermost form is [[[Lama Drakpo Tapur]] (Wyl. 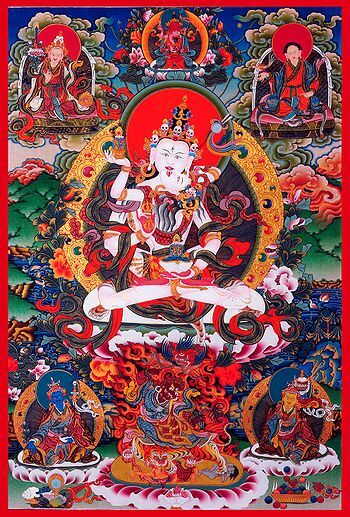 ''bla ma drag po rta phur zung 'jug gi dril sgrub zab mo''), The Profound Combined Sadhana of the Wrathful Lama Union of Hayagriva and Vajrakilaya <Ref> In the actual source texts of the Tsokye Tuktik, the innermost secret form of the lama is '''Lama Drakpo Tapur''', and not [[Dorje Drolö]]. But it seems that, as shown on many Tsokye Tuktik thangkas, oral lineage instructions have recommended students to focus on Dorje Drolö practice as the innermost secret form of the lama, considering the importance of the Dorje Drolö cycle in the Dudjom Tersar lineage.</Ref>. The Tsokye Tuktik is a lama practice focused on Guru Rinpoche. The outer form of the lama is [[Orgyen Menla Dütsi Bum Zang]], the inner form is [[Lama Orgyen Khandro Norlha]], the secret form is '''Tsokye Tuktik''' (Lake-Born Vajra, [[Guru Tsokyé Dorje]]) and the innermost form is [[Lama Drakpo Taphur]] <Ref> In the actual source texts of the Tsokye Tuktik, the innermost secret form of the lama is '''Lama Drakpo Taphur''', and not [[Dorje Drolö]]. But it seems that, as shown on many Tsokye Tuktik thangkas, oral lineage instructions have recommended students to focus on Dorje Drolö practice as the innermost secret form of the lama, considering the importance of the Dorje Drolö cycle in the Dudjom Tersar lineage.</Ref>.